Technology has revamped the world of banking to make it more convenient than ever. Online banking means we can get things done without having to set foot in a bank, or talk to a banker. Banks have embraced mobile apps to different degrees. In all, you can pay your bills and check your account while walking on a treadmill, waiting for the train, or stuck in traffic. In this article, we review three popular mobile banking apps among Malaysians: CIMB Clicks, Maybank2U, and RHB Now. With over 7.8 million customers, CIMB is one of the most popular banks among Malaysians. 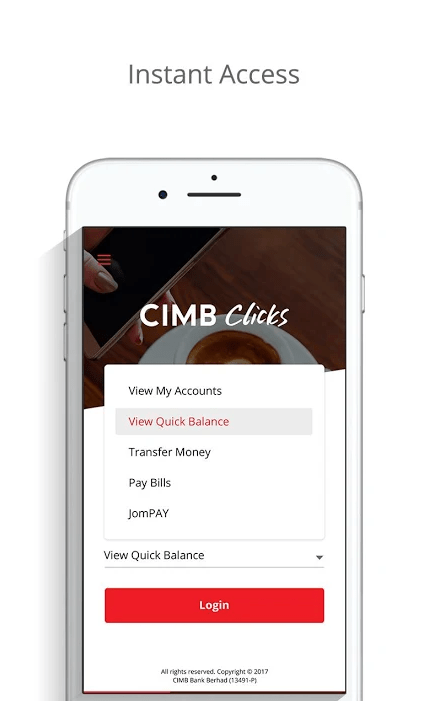 CIMB Clicks boasts a simple, user-friendly interface. The app allows you to select your home screen before you login. 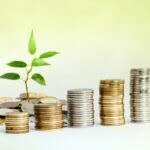 Immediately directing you to whichever function that is most important to you; be it just viewing your account, transferring money, or paying your bills. You can then log in and see what you want to see. Once you have logged in, there’s a menu on the left that lets you choose the services you want. The services listed here are Transfer Money, Pay Bills, Pay Loans and Cards, JomPay, Top Up, and Apply FD. Making transactions through the app is simple enough. We had no problems with making a money transfer, with the fields being easy to fill in and the TAC being received promptly. In all, it functions in exactly the same way as using a web browser. In all, it was a seamless experience moving from desktop to the mobile app. To log in, you would need to enter your user ID name. 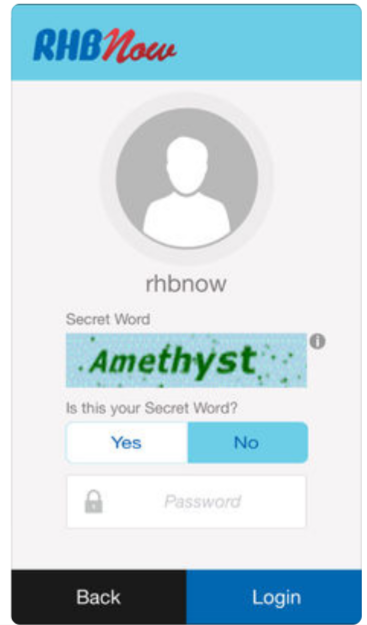 You will then be shown a personalized secure word. After that, you key in your password and proceed with the app. 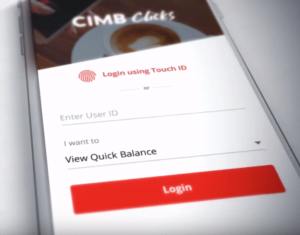 CIMB Clicks only requires a single login, and functions the same way as the CIMB Click website. Those using biometric verification can also use that option through their smartphone. Users with a fingerprint-enabled phone can easily log in with just a touch. However, this feature is only available on selected mobile devices, and it was also quite tricky to set-up. The instructions were a bit vague and the app failed to register a fingerprint; so we resorted to manual login instead, which is fast so we didn’t mind it. 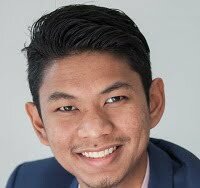 One concern occurred back in December 2018 when the CIMB Clicks mobile app implemented a reCAPTCHA system without warning. Reports of a possible data breach surfaced when some users noticed that there was a problem with the login system. 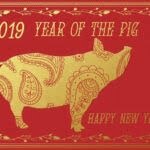 However, CIMB’s own investigations turned up no breaches of its database, and any potential problems were patched before cybercriminals could take advantage of them. 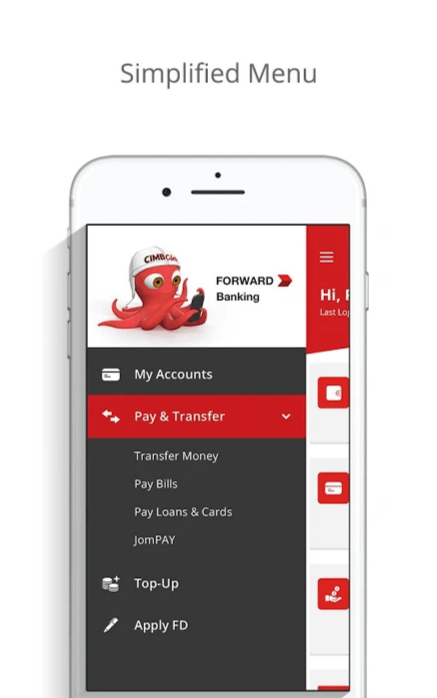 Overall, the app is basic and convenient, easy for transferring funds and paying bills. However, after multiple tries, it is still unclear how to check our transaction history via the app. Also, every time we tried to go ‘back’, it took us to the logout page instead of the previous page or step. Another popular mobile app among Malaysians is the Maybank2U app. 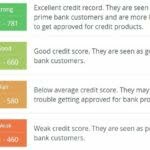 The Maybank app also has a good reputation among users on social media, despite some inevitable complaints. 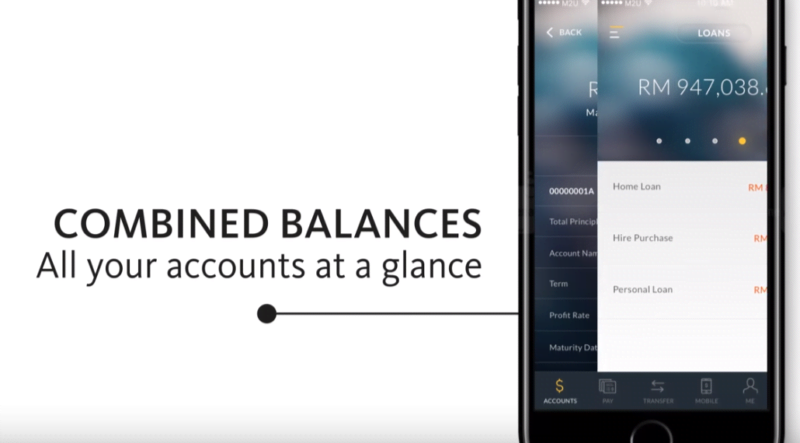 Over the years, Maybank has fine-tuned the app so much so that it becomes easier and more convenient for its users. Bearing the tagline “Trust, Control, Chill”, the app is meant to make your life easier with a ton of features on board. Upon logging in, you can view all of your account details by swiping left. 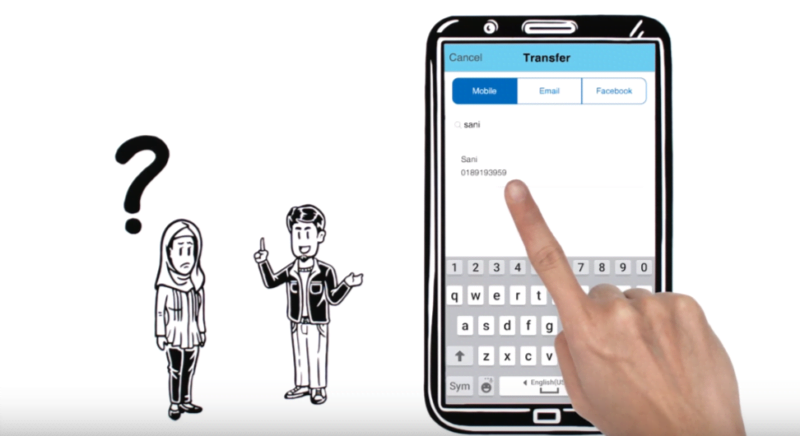 Like CIMB, when you’re making a transfer, all of the transaction details can be filled in on one page and then proceed for confirmation – which is quite convenient. You can pay your bills and cards in the same way too. 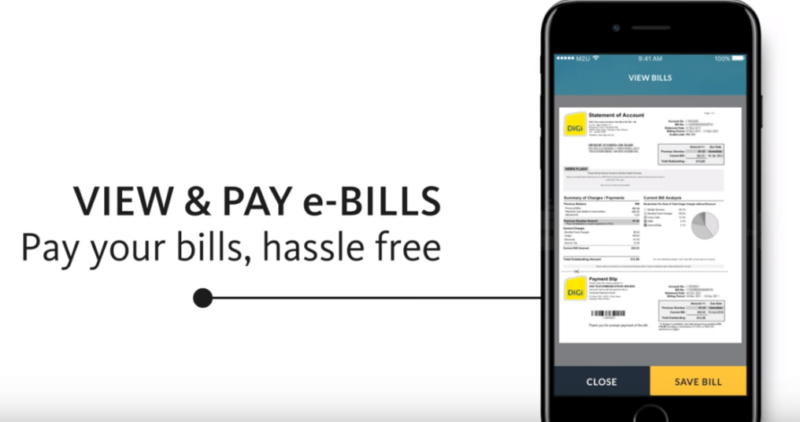 On Maybank2U, you can also view your bill before making the payment, which is a really cool feature because you don’t have to go back to your e-mail or text message to check how much you owe. Some other features on the mobile app that makes your life easy the cardless ATM withdrawal, application for cards and personal loan. The cardless ATM withdrawal is fairly new and most users we spoke to have not tried it out yet. Essentially, the app enables Maybank2u users to initiate a fund transfer to any Malaysian mobile number. Once a transfer is done, the recipient will receive a security code via SMS to perform the cardless withdrawal at any Maybank ATM Machines in Malaysia – all without requiring an ATM Card. This is a fast and convenient way to send cash funds to your family and friends when they need it the most. You can even use this service to send cash to yourself whenever you do not have your ATM card with you. 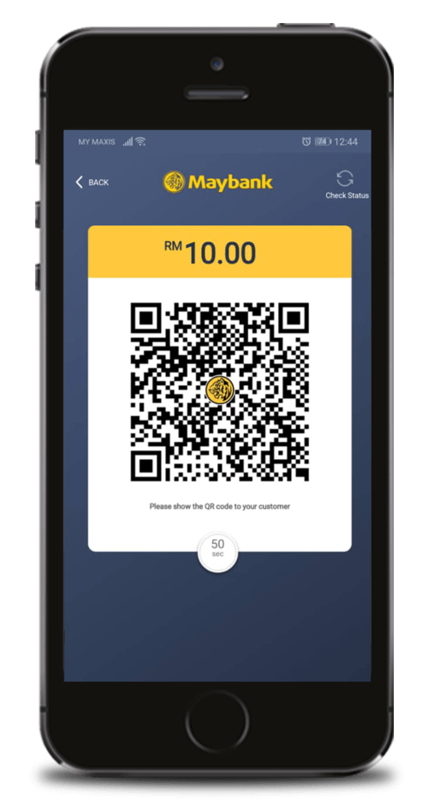 Another great feature on the mobile app is the Maybank QRPay, which allows you to pay for your daily expenses using a QR code. It’s convenient for those who have become accustomed to cashless, e-wallet payments. Otherwise, it’s just an extra cool feature you have on your app. It’s also worth noting that only Maybank has an integrated e-wallet in its mobile app. If you want to use the CIMB e-wallet, it you to download a different app (CIMB Pay), which is not very convenient. 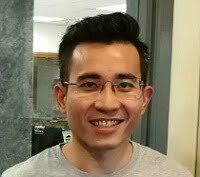 Maybanks boasts that it the first mobile banking app in Malaysia that has integrated three biometric features in a single app. The three biometric features are the brand new face ID, voice ID, and of course, quick touch. The best part is that all three login features work pretty seamlessly. We didn’t have any problem logging in with touch, face ID and voice ID. We also tried to fool the face ID by logging in with a photo, and we’re happy to report that it didn’t work. So, here’s the thing. 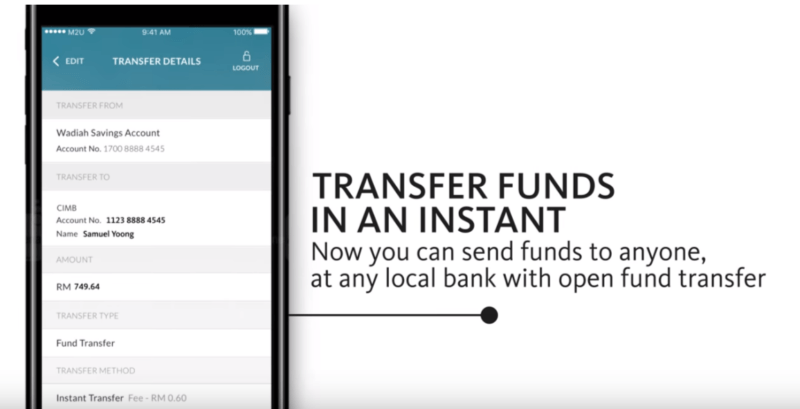 Although the app has some really cool features like the login and the integrated e-wallet, a simple task like transferring funds seems quite difficult to do. The Secure2U feature doesn’t work either. Secure2u is meant to replace the regular TAC received via SMS. Instead, you’ll be given a 6-digit TAC number generated on the mobile app itself. The Secure2U code takes forever to generate – even if it is safer than the traditional SMS path. 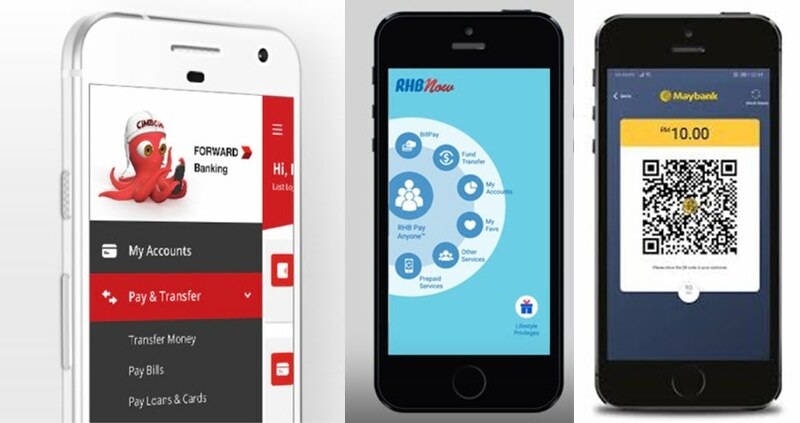 Aside from CIMB and Maybank, another popular mobile app among Malaysians is RHB Now. Most users find the app to be straightforward and easy to use. Its user interface is a calming blue. Upon login, you’re greeted with options like BillPay, Fund Transfer, My Accounts, My Favs, Other Services, Prepaid Services, and RHB Pay Anyone. 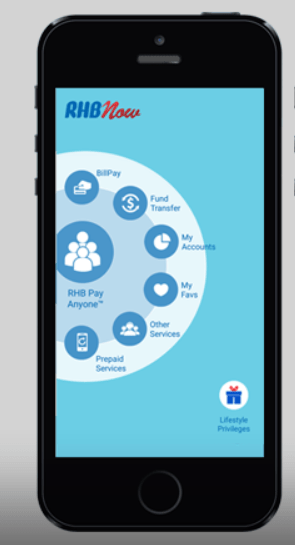 RHB Pay Anyone is an exclusive feature that allows you to transfer funds to anyone via mobile phone, email or Facebook – without knowing their bank’s account number. It’s basically an integration with DuitNow. Gone are the days when you need to text your friends to ask for their account number and waiting for their reply. RHB Now also allows you to transfer up to RM1,000 per day. My Favs is a feature that we particularly like. Instead of going through your list of favourite account numbers, RHB Now creates an icon for you as shown below – so you can just tap on it and transfer funds immediately. This saves a few precious seconds of scrolling through your list of account numbers. However, the My Favs feature is heavily relied upon to the point that it is intrusive. You cannot simply perform a fund transfer or prepaid top up; instead, the app forces you to create a favourite transaction first. It’s an unnecessary complication. Unlike its counterparts, RHB Now does not provide any fingerprint login or authentication. The login requires a simple username and password. Nothing too fancy here. What is interesting is that the app automatically verifies your TAC through Google Services. Skipping the need to type in an additional code to transfer money or buy a prepaid top up. Overall, we found the RHB Now UI to be somewhat poorly thought out. The icons are all arranged to the left of the screen. It looks like it was designed for one-handed use with the left hand, and requires a bit of stretching with the right hand – especially if you’re on a phone with a bigger screen. To make things worse, there are substantial loading times. Simply switch pages takes several seconds; made worse by that annoying loading bar that only serves to remind you that you’re waiting for something to happen. There’s quite a bit of front-loading in terms of getting the RHB Now app to work properly. Once set up, it becomes quite convenient to perform quick checks or send money. It’s a matter of trying to figure out if you’re willing to put in the effort. All three mobile banking apps seem to have different efficiency depending on the devices that they are accessed on. Some users love the app and the convenience it provides, while others always seem to encounter errors and lagging issues. Despite boasting some super cool features, all three apps still have areas to improve on. Based on all the user experience, the best app out of the three would be Maybank for three reasons. They consistently reply to comments on app stores and acknowledge customer’s feedback. They are way ahead of the game with three biometric features (face ID, voice ID, quick touch) for login, an integrated e-wallet in the app, and the one that impresses us the most – the cardless ATM withdrawal feature.